02/23/2018: 1973 Registry Car Count by Model/Eng/Trans added. Welcome to the Registry Thread. 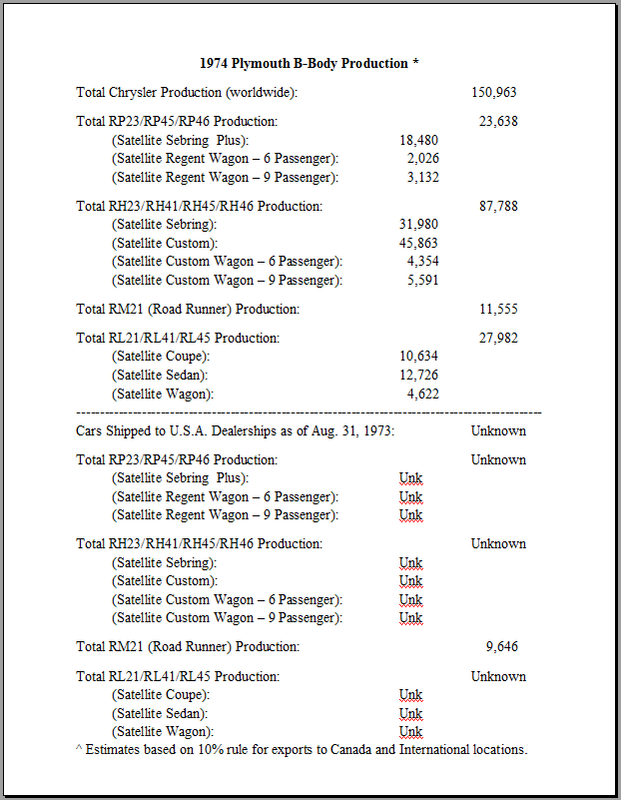 Since Eric has already put together a pretty good 71-72 database of cars, and I am not aware of anyone starting a registry for the 73-74 cars, I have volunteered to do this. 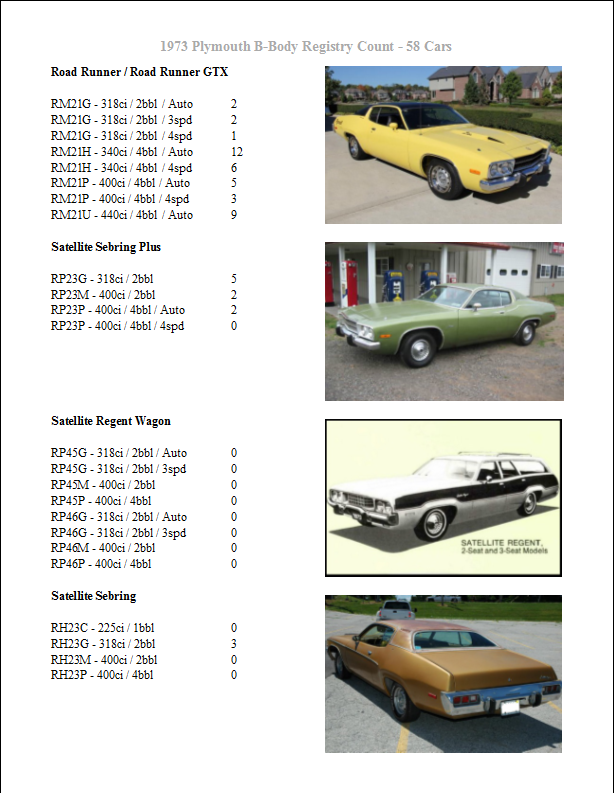 If there is enough interest and participation, this thread could evolve into a full blown stand-alone website similar to my Mopar Sunroof Registry site. With so much info that could be included in a registry, it would be impossible to get it all posted at once - so this will be a work in progress for quite a while. Here is a list of items that you can include in the registry. Owners can share as much or as little as they want - but item number 1 would be a bare minimum to participate. 2) A few additional photos of your car. Optimal shots include: A front/drivers angle, a rear/passenger angle, interior shot, and engine bay shot. 3) A very brief simple history of your car: Where/when you bought it, was it a project/survivor/restored/etc, and maybe a few things you've done to the car while you have owned it. 4) Additional documentation like pictures of broadcast sheets, window stickers, door stickers, and Galen reports are very welcome items. 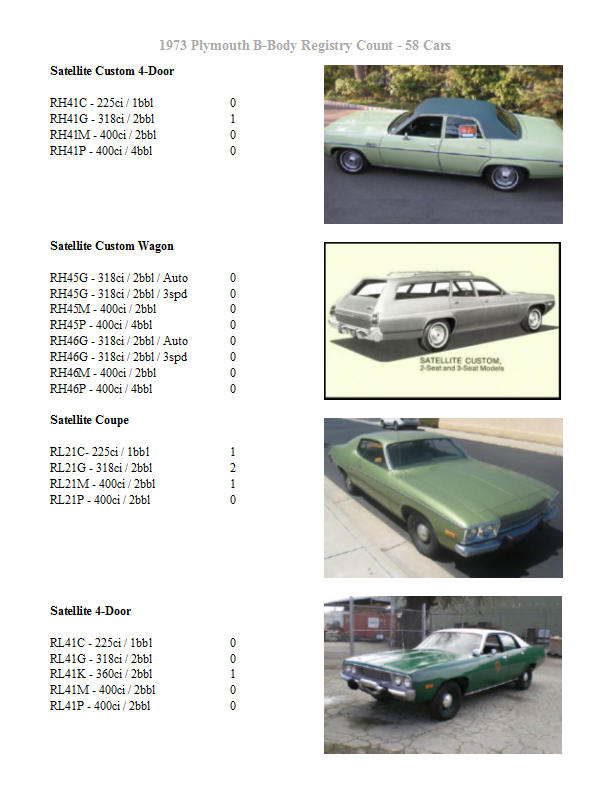 ALSO, If anyone spots a 1973-74 B-Body on eBay/Craigslist/etc. 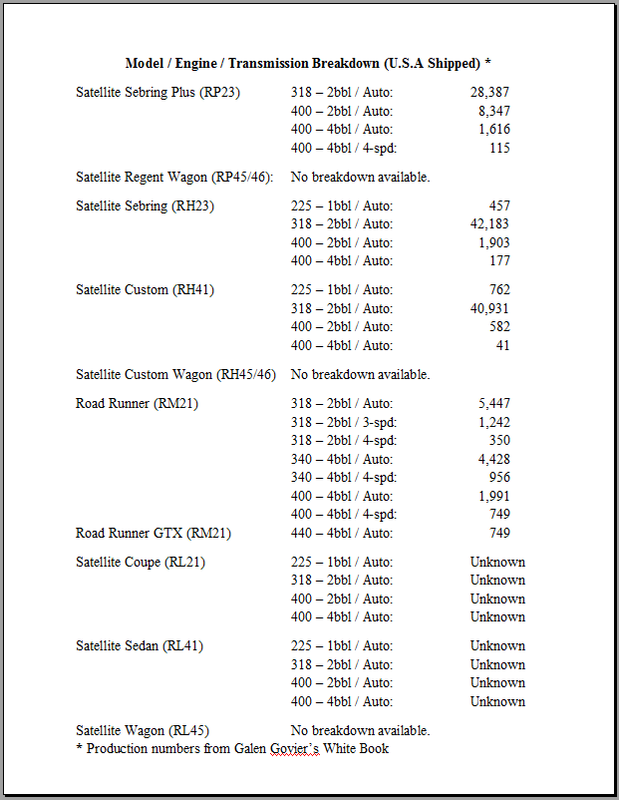 that has at least some VIN or fender tag data, shoot me a message at the email above. Thanks! 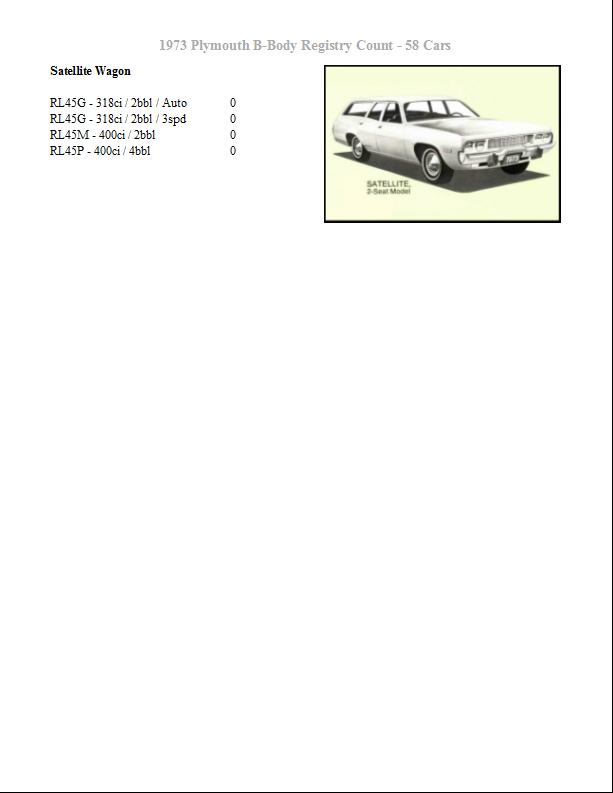 I currently have a little over 50 cars in the registry so far. Here is the population report by Model/Eng/Trans. 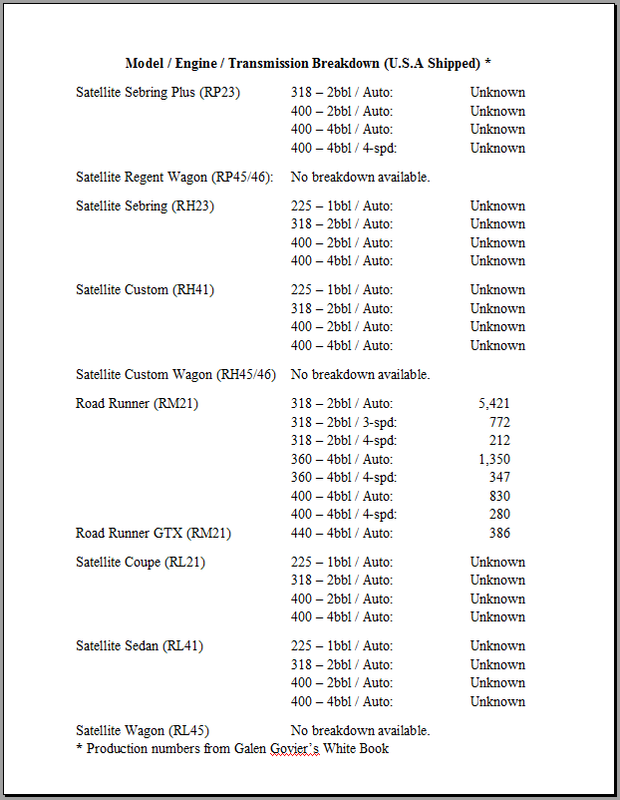 I currently have only 26 cars in the registry so far - going to need some help here! As soon as I get the 1973 cars sorted out, I will start in on the 1974s.